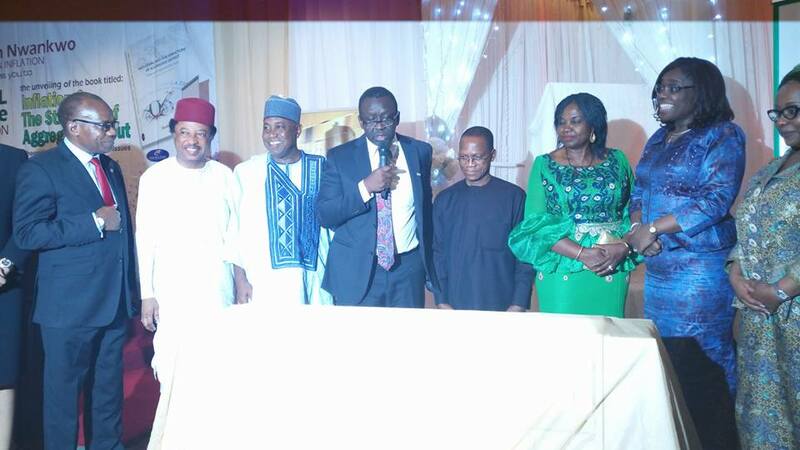 [dropcap]I[/dropcap]t was a farewell event at the Ladi Kwali Hall, Sheraton Hotel, Abuja, that only Dr Abraham Nwankwo could have engineered. In the hall last night, with minister of finance, Kemi Adeosun as host, several dozens of think-tanks, Nwankwo’s closest friends gathered to toast him before he completes his tenure Friday as Director-General of the Debt Management Office, DMO. The guest list also included Acting President, represented by Mr Dipoeolu Adeyemi, Economic adviser to the President, Minister of Transport, Rotimi Amaechi, Senior Special Assistant to the President on National Assembly Matters, Senator Ita Enang, Chairman, Senate Committee on Works, Senator Kabiru Gaya, former governor of Anambra state, Peter Obi, former governor of Cross River state, Mr Donald Duke, former governor Jim Nwobodo, Minister of Budget and National Planning, Senator Udo Udoma, Hon Jones Onyeriri, Ambassadors of France, Germany, Switzerland, and Senator Shehu Sani, chairman Senate Committee on Foreign and Local Debt, who has infuriated the Presidency by lambasting Buhari’s anti-corruption fight which he described as being selective recently. 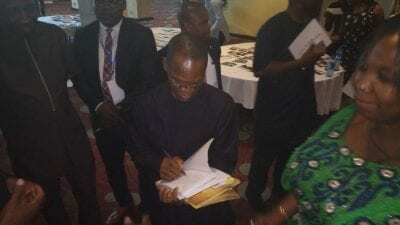 The list underscores how Nwankwo, despite being a professional, had a knack for building close friendships across the political spectrum and, almost unheard of in today’s bitterly divided nation, made few enemies in his 10-year tenure. “He likes to be challenged by intelligent people,” said a guest at the event. Nwankwo is scheduled to step down as the chief debt officer of the federation and hand over one of the most powerful economic job in Africa to Patience Oniha. He was the first Ph.D. graduate in Economics produced by the University of Nigeria, 25 years after the institution was established. After a term longer than that of any other DMO director general, Nwankwo’s departure will be an historic transition. Nwankwo is almost an institution in Abuja – ubiquitous in economic circles and constantly dispensing economic advice to top lawmakers, ministers, governors and presidents, regardless of which party is in power. 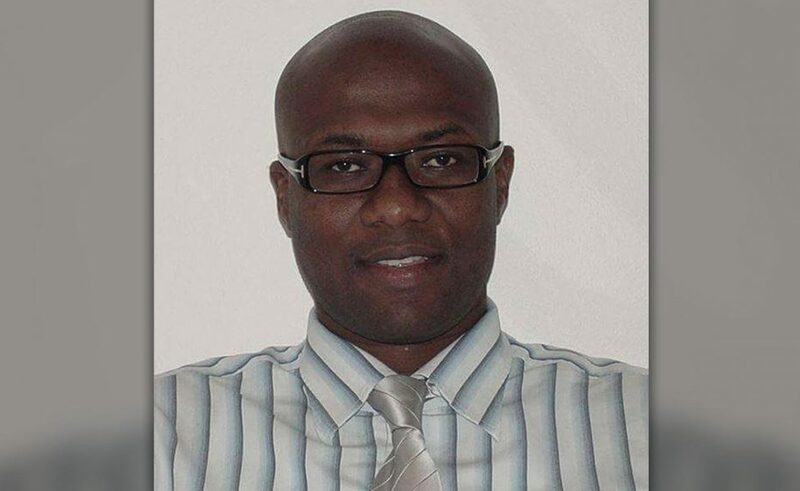 “Dr Nwankwo played two roles – one as DG of DMO and the second as an economic sage,” said Aminu Hassan, an economist. Nwankwo is not disappearing. 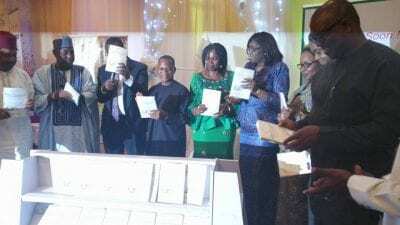 He launched his book Inflation and the Structure of Aggregate Output: theoretical, empirical and policy issues, on Thursday night.An economic icon after steering the debt management profile of the nation under three presidents, help create a stable economic growth. Nigeria’s debt servicing problems began around 1985, when the Nigerian government’s total external debt to all creditors amounted to $19 billion. 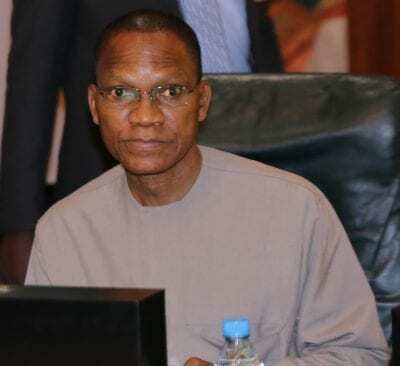 Under Nwankwo’s’ watch, the nation’s debt has been well managed despite stock market crashes, oil price fall, international financial crises, terrorist attacks, governors reckless borrowing and other shocks. No wonder, as he prepares to leave Friday, economists have lauded him as the greatest DMO Chief Executive in the history of Nigeria. Nwankwo, has always noted that there is nothing wrong in Nigeria borrowing as almost every government runs deficit budget in modern economies. According to him, “The logic is to re-balance total public stock in favor of less costly external funds. The result is a prosperity built on borrowing, say many economists, pointing to a string of recent records and firsts. Despite suffering its worst recession in 25 years with inflation nearing 19 percent, the Nwankwo led DMO in February made a strong statement of international investor interest in building exposure to Nigeria’s economy by achieving a rare feat in its $1 billion Eurobond. The $1 billion Eurobond was eight times oversubscribed, demonstrating international confidence despite Nigeria’s economic woes. No doubt, Public service in Nigeria is proving to be quite a perilous proposition. What, then, of a public servant who has spent 10 years as director-general of the Debt Management Office of Nigeria? To put his tenure into perspective, Dr Abraham Nwankwo has been at the pinnacle of managing Nigeria’s debt as an asset for growth and development. His resume includes guiding the economy through the stock market crash and weathering the economic recession. It is pertinent to note that in spite of the drastic drop in the country’s foreign exchange earnings, following the oil-price shock since mid-2014, the external debt liability hardly constitutes a source of vulnerability. During Nwankwo’s tenure the new Federal Government of Nigeria Savings Bond (FGNSB) was created purposefully to favour the poor and give them a stake in government. Over the years, the federal government has issued bonds, but it remained elitist bonds, which were sold as wholesale bonds to privileged individuals, corporate companies and organization. “All these super rich individuals bought it as wholesale bond, but the difference we have in the FGNSB is that we are making these bond available to the ordinary Nigerians,” Nwankwo said recently. The DMO within the past 10 years is well known for its high level of efficiency and qualitative outputs, owing largely to the DG’s untiring commitment and dedication – a work ethic that has rubbed off on the entire organisation. It is this fact that has led other countries such as Sudan, Somalia, Ethiopia,Uganda and Zimbabwe to visit the DMO in a bid to learn from its successes in debt management. The London Stock Exchange Thursday welcomed Nigeria’s first Diaspora Bond to start trading on the Main Market. The first bond of its kind from sub-Saharan Africa, according to the exchange. It is this final accomplishment that causes me to envision Dr Abraham Nwankwo as a great achiever. Sure, there will be criticisms of Abraham Nwankwo after his tenure ends in some quarters, but the truth is that whoever takes over the helms of affairs at the DMO cannot cover up the fact that he or she will have huge shoes to fill. While history will decide Nwankwo’s contribution during his tenure, the incoming DG will lead the nation’s debt management policy through some distinct challenges. Thanks for finally talking about >Nwankwo Leaves Behind Giant Shoes To Fill > PER SECOND NEWS <Liked it!